“The standard left-wing person never seems more comfortable than when attacking Israel.” This is the novelist Martin Amis talking to Ha’aretz when he was in Israel this past fall.“Everyone else is protected,” Amis continued, “by having dark skin or colonial history or something. But you can attack Israel.” Freely! Of course, it’s not only the standard left-wing person who is so empowered, but also those who belong to mainstream Protestant churches associated with the National Council of Churches on Riverside Drive in Manhattan. And those thoroughly emancipated Jews, many of them the children and grandchildren of communist and fellow-traveling ancestors; and those Jews who descend from a certain haughty assimilationist strain that was concentrated in central Europe and never quite understood, because their withered Jewishness did not equip them to understand it, the dangers that eventually destroyed their world. Roger Cohen reminds me of these types, British-style. Read for evidence of this in his vicious attack on Richard Goldstone for subverting and challenging by his own (it is true, arrested) honesty Cohen’s rancor towards Israel. Theories already abound on the Goldstone psyche. It was an emotional meeting last year with the South African Jewish Board of Deputies that set him on the retraction road. No, it was a bruising debate last month at Stanford University. No, it was a rightist Israeli minister telling him his report fueled those who knifed West Bank settlers. He was “broken,” one friend suggests. I don’t know. I asked Goldstone. He responded in an e-mail that he was declining “media interviews.” I do know this: The contortions of his about-face are considerable. There are also versions of this callowness in the Hebrew commonwealth. In Ha’aretz, the mother church of rabid contemporary anti-Zionism, Akiva Eldar recently whitewashed the report of the U.N. Human Rights Council’s “fact-finding” commission even though two of its four judges had found Israel guilty of war crimes long before a single session of the tribunal had been convened. The third has a long public record of stigmatizing Zionism as virtually a war crime itself. The fact is that, if Goldstone had true legal integrity, he would not have sat on a judicial panel with any one of his colleagues or, for that matter, participated in a proceeding under the aegis of the Council. Read between the lines of Cohen’s column and of Eldar’s, and you’ll find tropes virtually identical to ones which underlay a batch of Goldstone report cartoons in Arabic language publications and assembled by the Anti-Defamation League. Those who routinely attack Israel for this and for that and for still another transgression (all of them thought by now to be “inherent” to Zionism, I suppose) should have over the last four months found themselves in an intellectual and moral cul de sac. For the fact is that in condemning the Jewish polity so relentlessly—it is an “apartheid” state, it is an aggressive state, it is an unjust state, it is a lawless state, it is a racist society—they have for a long time absolved themselves from confronting the ugly character of Israel’s neighboring states. But this escape route is no longer available to people of even minimum honor. If they don’t come clean now they never will. Iran is the instance of a Muslim society for which reasonable people maintain hope, even expectations of radical change. The case is plausible. A deep history is glorious, textured (if not exactly “multi-cultural”), even relatively tolerant. The Shah was an agent of modernism and modernization, if also an autocrat who had others killed. But if you go back 2600 years you arrive at the time of Cyrus, rightly called Cyrus the Great. Contrast his behavior in the first exile of the Jewish nation and its return to the land with that of Mahmoud Ahmadinejad, who denies the existence of the Nazi genocide only to promise a different one—but for the same people. Sometimes all it takes is 30 years for a civilization to go into absolute decline. The decline in the legal and social status of women (not only being stoned for “crimes” against various tenets of Islam including having the misfortune of getting raped) is probably the most vivid measure of the degeneration. But there are others: the complete erosion of freedom of the press, the erosion of parliamentarianism, the erosion of elemental judicial independence, the erosion of middle class economic strength and cultural independence, the utter pauperization of the poor. A society so constricted can only be governed by brute force. Still, there is an Iranian opposition, a large opposition. It is brave and canny and longs for solidarity with America. For what other country’s solidarity should it long? Its neighbor Russia? President Obama has at last uttered some robust words—to use an apt, empty cliche of the moment—in opposition to the Tehran regime. Bravo! But his words were chintzy and reticent when the people were on the streets in 2009, and for more than a year thereafter. Rarely has a presidential fantasy delivered such a deadening blow to victims and opponents of oppression. So what was the fantasy? That he could somehow seduce Ahmadinejad into serious nuclear talks? No head of state since Neville Chamberlain has so deceived himself into believing that he had the craft and the craftiness to persuade the aggressor-tyrant to yield up his most fervent ambitions. The administration’s tactics to make the anxieties of the public about an Iranian bomb look hysterical revolved around simple dissembling, by State, Defense, intelligence agencies, and the White House itself. When will Tehran have the bomb? One year. No, two and a half years. As if that distinction really made a difference. Iran is the big prize for the new democratic agitation, but Egypt is close behind, and I fear that Egypt may break our hearts. It also had a parliamentary tradition of sorts imitating, if not resembling, the legislative conclaves of Europe. But it was not Europe, and until King Farouk fell in 1952, Great Britain was the real power in Cairo. There was a genteel elite, a cultured and even intellectual stratum in the capital and Alexandria, but not much suggesting truly free politics. Free discussion, perhaps, but not democratic politics. The colonels took over in 1952, slowly flattening whatever liberal pretense survived and turning themselves into an indulge-no-opponents dictatorship headed by Colonel Nasser who was at the head of the “third world” “non-aligned” movement of nations, another “progressive” artifice of the era. The fall of monarchs became a post-war tradition in the Muslim world. But it certainly wasn’t a progressive tradition: After Egypt came Iraq, Libya, Afghanistan, Yemen. And, by the way, Egypt fought a gas war against royalist North Yemen from 1964 until late 1967. A minimum of 2000 Yemenis, maybe more, died from mustard gas and phosgene-filled aerial bombs in Egypt’s territorial war against neighboring Arab land which it coveted. The U.N. played an ugly role in this. Secretary-General U Thant of Burma was asked to intervene with Nasser about the use of these forbidden tools of war. He said his “hands were tied.” Also during the spring of 1967 when Egypt was threatening war against Israel, Nasser demanded that U.N. troops in the Sinai acting as a buffer be removed. This time, too, his hands were tied and the soldiers were removed. The Six Day War ensued. The revolt against Mubarak was an impressive mustering of good will and bravery. And also of numbers. Yet the Obama administration treated the protestants in Tahrir Square and beyond as the carriers of some awful virus. With her usual rhetorical clumsiness, Hillary turned the tyrant into an antibody, a family member. I suspect that this is another one of those cases in which the president, with only an instinct to go on, decides that a pal of his is a friend of democracy and of the United States. Why, other than that reason, did he lavish the attention he did two years ago on Egypt and, for that matter, on Al Azhar University? It should be clear that the recent political outcome in Cairo, the exhilaration of Tahrir Square, was not exactly a verdict on Obama’s preferences. I doubt that similar disruptions are about to occur in Tayyip Erdogan’s Turkey. But the drift is toward clerical dictatorship, and we’ll see how that works out after a few years. Democracy under the army was more secure and more taken for granted than it is now. Erdogan’s party won the election and came to power. Forgive me, but I’m not at all certain that the Turkish opposition—forget about the poor and valiant Kurds—would be allowed to win any victories in the next election under the spreading theocracy. Obama’s first nod to the world’s Muslims—and it was an enormous nod—was his three-day trip to Turkey. No American president spends three days in any foreign country. So both his choice and schedule were significant. If the president wanted merely to enlist Erdogan as a neutral in the diplomatic balancing act with Iran he certainly did not succeed. In fact, Ankara has become an even more central pivot point in Tehran’s international maneuvering. In the Security Council and with the Russians and the Chinese, the Turks exerted tremendous effort to protect Iran from further sanctions. And Washington has gone easy on Turkey’s flaunting of the new restrictions. Perhaps the biggest standing issue between our allies in Europe (now western, central, and eastern Europe) and Washington is Turkey’s place in the European Union. The fact is that Europe does not want Turkey as a member. No one wants Turkey as a member. Whether the explanation is cultural (which I am certain it is) and demographic or the structural economic deficiencies of Europe—now worsening, as it happens, and certainly a contributing factor to the skittishness about more non-European “Europeans”—it is not a matter with which the U.S. should tangle ... and, even less so, take what purports to be a high-minded moral position. What the hell business is this of ours? Since the E.U. has become an unacknowledged instrument of virtually unlimited transfer of populations—that is, being a citizen of any state in the Union is a passport to any other state—there is a certain gall in the American president, whose country has strenuously avoided dealing with its immigration issues, hectoring Europe about what is essentially its demographic future. After all, there are nearly 80 million Turks, and that means 80 million Muslims. O.K., go ahead and deny this calculus. One can gauge the intra-European tensions on the matter by examining the fight that has broken out over France’s stoppage of trains from Italy filled with refugees from the Tunisian and Libyan distress. They landed in Italy, which didn’t especially want them, and many of them went by railroad on to France which certainly didn’t want them. Paris blocked their entry; the issue has not yet been resolved. cake and eating it too? “A sign of solidarity” with NATO, said the German defense minister. A hedge, I would say, maybe a smokescreen. Early on, President Obama demanded that Qaddafi strike his tents in Tripoli and surrender power. This was as close to an ultimatum as Obama had ever delivered. But quickly it became clear—not least to the madman in Tripoli—that words would not be matched by action and, in any case, America would not be dragged into what was seen simply as a humanitarian intervention. The secretary of defense, Robert Gates, has won some and he has lost some, but after losing the argument about American intervention in Libya he won the argument about the hobbling of that intervention. The Pentagon announced last week that it would make available for NATO two pilotless but armed Predator drones—not three and not four—to detect and destroy hidden Libyan weaponry. Megan Scully points out in National Journal that our previously provisioned Predators were unarmed and limited to surveillance, intelligence, and reconnaissance in usage. Still, Gates’s emphasis was on how restrained our contribution was to the effort. And, believe me, it is. So the Libyan rebels are left with two real military allies, Great Britain and France, and one tiny contingent of Italians in fancy uniforms. NATO has not brought very much to the skies and fields of battle. Yes, it has strengthened the rebels but not come close to defeating the regime. The alliance itself is less a military union than a loose association of armed soldiers under different commands. In any case, the rules of battle are so varied by national mandates and standards that it might as well be a jamboree of scout packs. There are 28 members (including this and that), 22 partners (including that and this), plus other widely dispersed governments, some not functioning at all. It is true that NATO is making a commendable fight against the Taliban and allies in Afghanistan, although it is also causing multitudes of civilian casualties which, if Israel generated them, would bring all the nice human rights agencies down on them big time. There is little doubt among civilized folk that Qaddafi is a monster, that he has ruled under monstrous rules and procedures. (Amid the raging battles, he has asked the Costume Institute of the Metropolitan Museum of Art to organize an exhibit of his military fashion designs.) His country is rich in oil and its people do not suffer from hunger. In fact, Libya has great wealth, but its cultural styles do not suggest the lavish ways of the petroleum kingdoms and emirates. The population is about 7 million, half of them under 15. There are no real winners in a society like this, especially as it is still riven by tribes and clans, more than 150 of them. Social science does not know how to deal with such a place. And neither do the great powers, insofar as they are dragged into caring at all. It is, of course, quite possible, maybe even probable that Qaddafi will win the war for control in the country, even if portions of it remain with the disparate opposition. Some critics of the Western effort to help overthrow Qaddafi are dismissive of his opponents. They are not real soldiers, they are not disciplined. They are bravado fighters. I’ve seen some of them on television: more swagger than discipline, bluster, boasting. But they are undoubtedly brave, and their military weakness says nothing about the justice of their cause. Which leaves us with the question of humanitarian intervention. No one (in Europe, certainly) wants to go to war unless it is a humanitarian intervention. National or alliance interest no longer is a gauge of justice for waging war. That is, it is no longer a gauge of justice in the West. Dictatorships have no such compunctions. This remains a virtually unexamined quandary for the democracies. It is all over Washington, but with much disbelief there and elsewhere, that the president and his secretary of state are awarding themselves high marks for both their grasp of “Arab spring,” as if spring is what it will end up being. Their self-congratulation is most absurd in the case of Syria. 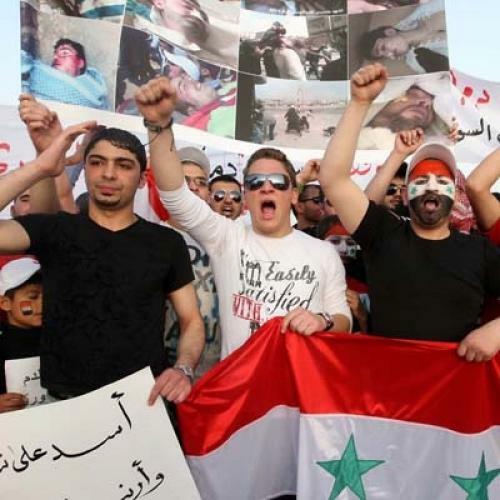 Like much of the press corps, and much of the foreign policy establishment, they fastened on the reasons why Bashar Assad would be immune from the popular unrest that was deposing other Arab tyrants. Maybe it was only Vogue magazine that was stupid enough to run a lavishly photographed article about the charming and democratic couple that runs Damascus, but many in the opinion “smart set” also thought that the Assads were there for the long run. Including, to be sure, Obama and Mrs. Clinton who sit at the top of the set and instruct the policy professionals in what they should do. If any issue beclouded the president’s vision of the Arab world more than the Palestinian saga, it was Syria. Now, Syria has a glorious antique past full of Amorite, Canaanite, Jewish, Roman, and Christian history. In fact, it has cared for these relics of others perhaps better than any other Arab country. But it is modernity with which Damascus has not come to terms. The crux of the matter is the shattered religious mosaic of its history. Tom Lehrer could have written a song about this: The Christians hate the Alawites and the Alawites hate the Sunnis and the Sunnis hate the Druze. (There used to be Jews in the country. Aleppo was once a grand Jewish city. But there are no Jews in Syria now.) Mostly, everyone hates the Alawites, really hates them, and they hate everybody else. Alas, the Alawites are a schismatic sect, not especially pious, vaguely attached to the very religious Shia of whom there are few in the country, maybe 11 percent. When—and if—the Assads are displaced, the Alawites who enriched themselves over four decades of rule by papa and the ophthalmologist son will be slaughtered. Not quite as they slaughtered the Sunnis of Hama in 1982, when anywhere from 10,000 to 40,000 of them were transported by bombs and roll-over tanks into the world to come. The fact that no one really knows how many is a mark of how little the world cared, and the United States cared not more than others. But for the Syrians it came very quickly. No one reported this bloodletting for about a week. The commander of the Hama operation was Bashar’s uncle, Rifat. Killing was a family business. And it still is. It is true that the Obama government did not over the years pay much attention to the tyrannical essence of Syria. Obama had another agenda on his mind: the peace he was so eager to make between Syria and Israel. It was beginning to dawn on him that maybe he had squeezed the Palestinians into the settlement trap when, if anything had been already agreed on between Jerusalem and Ramallah, it was the rough cartography of a possible peace. Everybody knew that, if any practical peace were to be arranged, many Jews would live permanently in a few places over the 1949 armistice lines. That the president doesn’t grasp the real issues between the Jews and the Arabs is almost self-evident. They are of the essence, the essence of history, the essence of civilization itself. So maybe he could bring Syria around if he could get Israel to relinquish the Golan Heights, which is a practical issue not of the essence. But Syria is not to be trusted. It is not to be trusted even with its own population, let alone with the physical security of Israel’s population. Would you hand over to a bloodthirsty mass gangster the huge plateau over your flatlands? Would you trust a regime that has trafficked in atomic weapons with Iran, North Korea, and rogue scientists in Pakistan? The hot-headedness and the cold-bloodedness of Syria is not an exception even in our time. But it’s hard to recall our America, our president, and his secretary of state and their errand boys courting the rule of terror without so much as a blush. But with their gift of certainty and pietistic enthusiasm. Why is the president still so clipped and ineloquent about Bashar Assad’s recent atrocities? The secretary of state has given Assad all the relief he requires: The U.S. will not intervene in Syria. NATO won’t either. The brave people in the streets of Syria’s cities are on their own. Their Arab spring will be impeded by a wintry America. And while Bashar Assad will not be made to feel the American chill, Benjamin Netanyahu certainly will. Israel is, at least for the moment, freed from the pinions of Obama’s delusions about the peaceful intentions of Syria. The Israeli prime minister will soon travel to Washington, and his intentions were constrained by the president’s not less delusional thoughts about Palestine. But these too should have been shattered in the last days. For nine months out of a projected ten month period during which the Israelis had not added to a single settlement and during which time the Palestine Authority had pledged to negotiate on the salient issues with Jerusalem it refused to come to the table. In fact, it didn’t have to come to the table. All it had to do was talk with George Mitchell, that now unseen sad-sap of a middle man, who would in turn confer with the Jews. Well, it stalled ... and stalled and stalled. Now it has embarked on a perilous journey: making peace with Hamas and forming a government with it. There are no subtleties to the political and religious aims of the people who now govern Gaza. It is a febrile Islamist movement, allied with Iran and with Syria. It has murdered many more Arabs than it has killed Israelis—but not for wont of trying. A Fatah spokesman has assured the Palestinian masses that Salam Fayyad will not be a member of the interim government that should emerge from this pact. If you are hopeful about peace you are crazy. Barack Obama has thus far said nothing. It is very hard to comment when, day after day, one illusion after another, one delusion after another crumbles in the sands. Say goodbye to Palestine. At least for the foreseeable future. And even if the General Assembly recognizes the fable for a fact.